TRUST ISSUES: Bloom and Rapace have a stand-off in this scene from the action thriller. NOOMI Rapace has an intensity well suited to gritty action-packed thrillers. No wonder she’s the original Girl with the Dragon Tattoo. The Swedish actress, a tough-cookie at heart, brings that same broodiness and steely edge to her work in Unlocked, a riveting and strongly acted psychological thriller-drama that rewards viewers who like to pay attention. 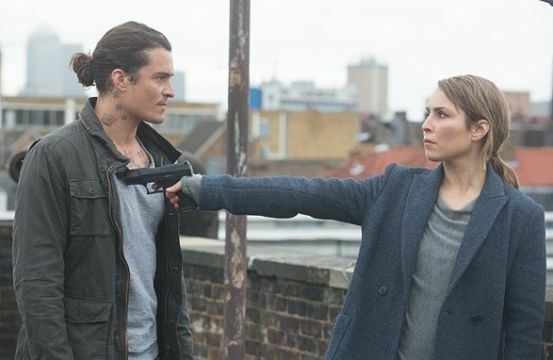 Rapace stars as Alice Racine, a CIA operative now making life as a low-key employment case worker in London, following a failed operation in Paris that claimed many lives. Five years on, she’s still licking her wounds. “I can imagine the burden of those deaths, but it was never yours to carry,” her MI5 colleague Emily Knowles (played by the always welcome Toni Collette) tells her. Alice, a fierce fighter and a ferocious interrogator who specializes in speedy work that bears results, gets lured back onto the field when she’s approached by a senior agent with an order for her to interrogate an Islamic terrorist suspect — only to discover in the nick of time that it's a hijack of a planned CIA interrogation. To get some answers, she teams up with an ex-soldier named Jack Alcott (Orlando Bloom) but, ultimately, she must decide if she can trust a man whom she first encountered as a burglar caught in flagrante delicto. Before long, Alice realizes that the affair she's embroiled in is far more sinister than she thought. It's a complicated life-and-death mission, culminating in a race against time to foil a biological terrorist attack that would forever change London life. Working with screenwriter Peter O'Brien to bring this frequently jolting, edge-of-your-seat film to audiences, director Michael Apted, who knows how to ratchet up the suspense, assembles a first-rate batch of actors, including screen legends John Malkovich (who plays Virginia-based CIA Division Chief Bob Hunter with a blend of crankiness and nonchalance) and Oscar winner Michael Douglas, who brings charm and cunning to the role of Alice's mentor Eric Lasch.